Homepage / Dating / Signs He's Still Dating Others - Don't Get Played! Are you worried that the guy you’re seeing is still dating other women ? Are you concerned that he might be keeping his options open or that he wants to date other women? 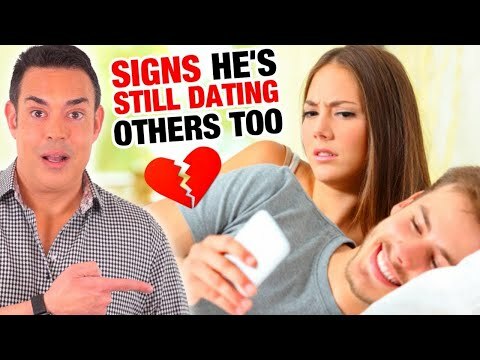 Well, stay right here because in this video I’m going to share the signs that he’s playing with you but still wants to date others too, don’t go anywhere because we are starting right now. hi everyone.. I’m dr. Antonio Borrello and I’m a psychologist and relationship coach. This channel is all about helping you build great relationships so you can grow happy with the people you love. So, if you’re interested in making your love life the best part of your life, start now by clicking the subscribe button and the bell notification so you aren’t missing anything. OK… on to the signs your man is keeping his options open or dating other women. In the early stages of new relationships, there is a period of time where the relationship is kind of undefined. It’s the time between the first date and when you are in a fully committed relationship. It’s a very vulnerable time because you are starting to get excited about a guy, but you’re not completely sure of how he is feeling because you haven’t had that “what are we” talk. And It’s not uncommon for couples to avoid having that talk for weeks, and sometimes months. During this time, people might assume there’s an unspoken understanding in place not to see other people.. .but be be careful.. You should never assume..
And you certainly don’t want to go all in with your heart, only to find out that he is not that serious about you and still playing the field and dating others. So, keep your eyes open… and if you’re seeing one or more of the following signs.. you’re probably not the only woman in his life. 1. He has other plans often. He makes a point to see you, but it seems like he has tons of blackout dates that just aren’t good for him because he says that he has “plans”, but without going into any details.. Like he doesn’t say “I’m having dinner with my parents on Friday” instead he describes his plans in more generic terms.. He might say I have dinner plans on Friday. Or simply I’m busy this weekend, etc. 2. . He goes missing for hours at a time. He’s usually very responsive to you via texting throughout the day, but on some evenings, he goes MIA until very late at night or even the next morning. Then suddenly, it’s back to constant messages…without any explanation, of course. The guy who is keeping his options open doesn’t want to lie to you about dating other women, so he goes silent while he’s busy with someone else. He’s not going to be actively engaging in a text conversation when he’s with her, right? Instead, he probably has his notifications turned off, has silenced or even powered off his phone… So, if the man you’re dating frequently disappears into thin air, it’s time you realize that he’s definitely keeping his options open. 3. He cancels on you pretty regularly. Let’s face it, things happen, and a date cancelation is bound to occur at some point. But if the guy you’re dating is canceling your dates over and over again, it could definitely be a sign that he’s keeping his options open. Men who are dating others will frequently cancel on you if a better option comes around. So, he comes up with an excuse to blow off your date so he can spend time with the new person he just met at the bar last night. On the flip side, he will also try to spring plans on you last minute.. often in the evening, asking you out for a drink or to a movie because his plans changed. Now, if this was the only sign, it could mean that he’s excited to see you and will jump at every opportunity.. But if everything else about him seems a bit off, it’s not unreasonable to think another date canceled on him, especially if he doesn’t regularly make advanced dates with you. So stop giving in and agreeing to see a man at the last minute if a relationship is what you’re looking for. Chances are, he’s keeping his options open, and do you really want to waste your time with someone who’s still playing the field? 4. He safeguards or hides his cell phone. In a relationship, being open and honest about everything is important. But When a guy has something to hide, one of the first things he’ll begin to do is keep his cell phone private. So pay attention to what he does with his phone when he is with you? Does he have the ringer and notifications off? Does he keep the phone face down on the counter when you are hanging out? Does he always take his phone to the bathroom and seem to be gone for an unusually long time? These are all possible signs that he is trying to keep his communications private and doesn’t want you to know about them. Oh.. and here is another big one.. He never even shows you pictures or videos on his own phone. That’s because he’s worried about the texts that might come through while you’re looking at the screen. It’s subtle, but when you’re hiding something you’re certainly worried that a provoking text message might give you away. And if you’re having an emergency, and you need to use his phone, he will definitely hesitate before handing it over. 5. He maintains several friendships with women that you have never met. Yeah.. this is a huge warning sign. Sharing your life with someone involves developing relationships with your partner’s friends and family. In other words, we want our partner to be liked and approved of by the friends and family we love. So, if you’re sharing your life with someone, their friends should become your friends too. Their friends should want to meet you and know you, right? But if your man is maintaining friendships or relationships with other women and he avoids introducing you… you must question their motives and the appropriateness of their friendship. Like What or who is he hiding from you, and why? 6. He Won’t Include you on His Social Media Is your guy constantly updating Instagram or facebook and posting photos with friends… including other women? Do you feel like you’re the only one who doesn’t get any love on his social media accounts? In other words, Is he trying to make it look like he is single? And, more importantly, has he avoided adding you or connecting with you on facebook or Instagram. I mean When you’re interested in someone, it’s natural to add them as a friend on all the popular social media websites. A guy who is dating you (and only you) will have no problem adding you to his friends list almost immediately. As a matter of fact, he will probably add you before you even ask to add him. But if he is keeping his options open, he may try to keep his social media accounts a big secret. And if you send him a friend request and he declines it, pay attention. he may tell you that his account is only for close friends and family, but in reality, you might be one of the many women he’s dating (or wants to date) and he’s trying not to blow his cover. 7. He doesn’t want to put a label on things.. For some couples who have the opportunity to see one another and communicate frequently, it might only take several dates over a few weeks to a month and they know they want to be in an exclusive relationship.. a committed relationship. For others, Look, it’s understandable to take some additional time to get to know one another before deciding to commit to a relationship.. in that case, it’s just a matter of a little more time and having that talk.. the understanding that you will only be seeing each other. But if you’ve been dating intimate for several months and still doesn’t want to “complicate things” or he mentions that he doesn’t want a relationship or anything serious right now.. then yeah… that’s his nice way of saying he’s keeping his options open. Out of everything here, this is the closest you’ll get to concrete evidence. 8. Your Intuition tells you that something isn’t right. If deep down you feel like something isn’t right with this person, you’re probably right. And you’re noticing it for a reason. When you start to put the pieces together, your suspicions will, without a doubt, be right. If you don’t listen to anything else I say, listen to this: Intuition is your best friend. So Don’t Ignore Your Best Friend’s Advice. But I know, I know… I’ve been there too… hearing that little voice in my head telling me that something just isn’t right, but choosing to ignore it in favor of what I wanted. It’s the D word – Denial. Our brains use self-justification and self-deception to manipulate our thoughts and behaviors to explain, defend, and protect us from recognizing unacceptable truths. And when we blind ourselves to our true motivations and feelings, we unwittingly sabotage our own efforts for happiness and satisfying relationships. Don’t let it happen to you! When making difficult decisions about a relationship , fight the urge to ignore your intuition. Listen to that inner voice.. listen to that gut feeling. make the decision, and then act on it. Period. That’s practicing self love.. and it can be challenging especially in times when we are feeling hurt and facing difficult decisions. But by doing what you know you should do, you are actually strengthening your love for yourself, and your ability to recognize the things that are undermining your well-being and happiness. Use your intuition.. and listen to that inner voice. Just be careful not to immediately distrust a new partner on the basis of your past relationship. Doing so is like being a prisoner to that old relationship and likely to sabotage the next one. Remember, both Trust and Distrust result from time and experiences with a partner. Both are earned and should not be assumed. you certainly don’t want to accuse your partner without being absolutely sure. So, If you are seeing one or two of these signs, it’s probably best to just keep them to yourself..
And keep your eyes open.. because if he is seeing others, more signs will pop up and you will know soon enough. So just keep your eyes open and be patient… This is super important and I cant stress this enough.. wait yes I can… go back and rewind 15 seconds and listen to this part again… you could ruin a newer relationship if your fears are unjustified. So yeah. I’m serious.. rewind 15 seconds and listen to that again. So.. are you in a relationship or dating someone that you suspect might be dating other people? Or, Have you ever been blindside by a person who you completely trusted? Were the warning sign there but you missed them. Leave a comment and let us know what happened.